Acrylic & Polycarbonate can be polished to a glass like finish using vapor polishing techniques. 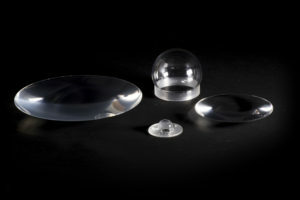 We have vast experience and expertise in polishing Acrylic, Polycarbonate, Ultem and most engineering grade plastics. Our main polishing services include manual and mop polishing and when exceptionally high levels of optical clarity are required for Acrylic and Polycarbonate, we use a specialist Vapor Polishing technique (also know as Super-Finishing). Using vapor polishing, engineering grade plastic materials such as Acrylic, Polycarbonate and Ultem can be polished to a glass like finish with astonishing optical clarity and can have similar optical properties to glass. We also polish coloured Acrylics, Plastics, Polycarbonates and most other plastics to achieve a very high aesthetic finish. Vapor polishing is a specialist method of polishing plastics to reduce the surface roughness and/or improve optical clarity. Typically, a component is exposed to a chemical vapor causing the surface to flow thereby improving the surface finish. This method of polishing is frequently used to return clear materials to an optical quality finish after precision machined. Vapor polishing works well in the internal features of components. 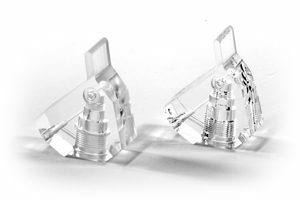 Vapor polishing is a specialist technique that can be used to enhance component features on materials such as Acrylic (PMMA) or Polycarbonate. Vapor polishing is ideally suited to the polishing of small features and offers improvements to internal and external surface finishes. It has the advantage of being able to polish internal, detailed features such as threads, apertures, channels and sample inspection areas that would be impossible with manual polishing. Super finishing is a term used to describe Carville’s unique vapor polishing process. lenses and light guides. Carville offer a vapor polishing service for components produced by other companies. Our vapor polishing service can be used to improve the cosmetic appearance and transparency of components, however, the results will be dependent upon the quality of the original parts. If a part has a very rough surface finish, the end results will be variable. All Acrylic / Plexiglas and Polycarbonate components manufactured by Carville are fully heat treated prior to and after machining. Components which have not been fully heat treated will have internal stress and can be damaged by the vapor polishing processes. However, this service is offered on a best endeavour basis and is subject to the quality of the components supplied. When processing components produced by other companies, we will often heat treat the free-issue components, clean the parts, perform the vapor polishing process and then clean the parts again before packing for dispatch. Acrylic and other engineering plastics can be mop polished to improve the surface finish / roughness and appearance. Polishing requires the removal of material and it is essential to achieve a good machined finish before polishing to ensure critical dimensions can be maintained. Mop polishing requires different grades of mops or clothes used in conjunction with abrasive soaps which remove surface material and leave high quality polished finish on Acrylic and other plastics. The type of mop polishing process will be subject to the quantity and shape of parts. For lower quantities, mop polishing will be a manual process with each part individually finished by hand, but for higher quantities, Carville often use automated instruments and processes. A good surface finish starts with careful selection of machine tooling, heat treatment, diamond milling, machining methods and preparation processes, to produce a part with minimal witness marks in critical areas. (See page Page 4 of Carville’s product brochure for a comparison of 5 components, dimensionally identical but produced using a combination of different machining and polishing techniques).